The Friday before the mass shooting at the Pulse nightclub, my husband and I went to a concert. My husband is the concert enthusiast in our marriage, I tag along because I enjoy his company. I have a love/hate relationship with concerts. With a few notable exceptions (looking at you Brian Fallon -- RIP Gaslight Anthem -- and The National), I don't really like any one group enough to want to listen to it for that long, that loud, with people I don't know at all spilling drinks on me and "accidentally" grabbing my breasts when they "stumble" while holding a one-person mosh party in a crowded venue. I especially have trouble enjoying the opening bands, who are often more miss than hit. This is a problem with me, not them. Long way of saying I did not have high expectations when we mistimed our arrival at the venue and did not miss the opening band. Best mistake ever. The opening band was Told Slant, and they were awesome. After a few songs I told my husband I was really glad we came early. A few more, I told him I was going to buy their t-shirt at the break. At the end of the set, I told him to buy the album when we got home, please. So then there was the most deadly mass shooting in the US. I learned through a post on the Stash Bee that the Orlando Modern Quilt Guild was collecting heart blocks to make quilts for the survivors, victim's families, and first responders. The blocks were easy, so I made a few. Then I made a few more. Then I decided that they were so easy I should just make a whole top. Told Slant's first album, Still Water, was playing on an almost uninterrupted loop every time I sat down to sew. The music fit the project. A line on one track says "I hope your sister grows up, and thinks that the world is beautiful." My middle child happened to walk into the room once when that line played. He looked at me very earnestly and informed me that "actually mommy, the world is beautiful." 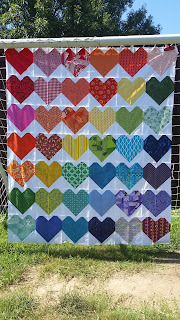 My daughter, who is now 4, saw all the hearts on my design wall, and said that they were pretty, and "I sure do like that quilt!" That is her way of hinting that she sure would like the thing for herself. When I just thanked her for her compliment, she gave up hinting and just directly asked who it was for. I explained the quilt drive. She got quiet, and said "what were their names?" We looked up the names and pictures of each of the victims - I thought she'd want to stop after a few, but she looked at every single person.